At close of business on Monday, Judge Lucy Koh granted Samsung's request to dissolve the preliminary injunction against the Galaxy Tab 10.1, following a limited remand by the Court of Appeals for the Federal Circuit. But after a hearing scheduled for December 6, Apple can still win a permanent injunction over the D'889 tablet design patent if it prevails on the related part of its Rule 50 ("overrule-the-jury") motion. In fact, that possibility is part of the reasoning Judge Koh provides for her decision to dissolve the preliminary injunction without previously adjudicating Apple's Rule 50 motion: she dissolved the preliminary injunction that was in place because she would never have granted one if she had expected the jury to find in Samsung's favor on the D'889 infringement issue. And in footnote 2, she stresses once again that "[t]he Court is not in any way commenting on the merits of any of the parties' post-trial motions". While I believe that it would have been problematic to keep the Galaxy Tab 10.1 injunction in place under the current set of circumstances, I'm not sure that this approach of simply not assessing the likelihood of success of Apple's meanwhile-filed Rule 50 motion at all was correct. In late June, Judge Koh ordered the now-dissolved preliminary injunction and cited to a 2008 Supreme Court decision, Winter v. Natural Res. Def. Council, which is frequently cited by U.S. courts to lay out the circumstances under which a preliminary injunction may issue. The entire Winter opinion does not mention the words "trial", "jury" or "verdict" even once. It merely refers to "likelihood of success on the merits", which means that if Apple was sufficiently likely to prevail on its Rule 50 motion, it would satisfy that requirement. You have success on the merits if you win when all is said and done. In a totally hypothetical scenario, if a court knew (in terms of "if we knew then what we know now") that a jury would find in favor of a claim but that the defendant would subsequently succeed under Rule 50 and be cleared of infringement, it would have to deny a preliminary injunction -- a jury verdict is not "success on the merits" since it's an interim step, albeit an important one. 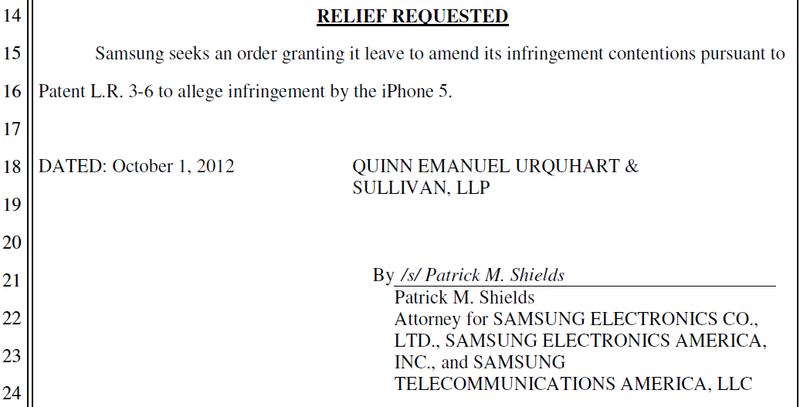 Samsung seeks an order granting it leave to amend its infringement contentions pursuant to Patent L.R. 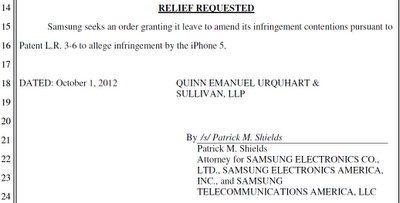 [Local Rules] 3-6 to allege infringement by the iPhone 5. Samsung had already informed the court of its intent to attack the iPhone 5 in a September 20 filing, the day before the product started shipping. The October 1 filing now says that "as soon as [the] iPhone 5 was available for purchase, Samsung began its investigation of the product and within a week "determined that the iPhone 5 practiced its patented technologies". Samsung tells the court that it would be more efficient to address the iPhone 5 in that second California litigation between the two parties than to file a new one over the same eight Samsung patents only to target the iPhone 5. Samsung says that "[t]he iPhone 5 has the same accused functionality as the previously accused versions of the iPhone, so the proof of infringement of the patents-in-suit by the iPhone 5 is the same as for other Apple devices already accused of infringement in this litigation".